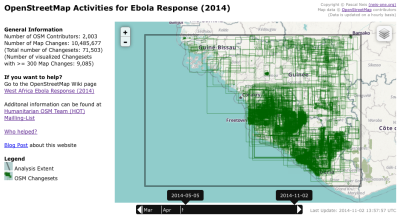 Ebola Response Map and OSM contributor analysis : Neis One! A complete list of all OSM contributor names with their number of map changes can be found here. It’s really fantastic, “Thank you & keep up the good work!”. This time I have also spent some time to analyze what type of contributors helped in this scenario. The following diagram shows the number of contributors per month in the above mentioned analysis extend. Additionally, it contains information on how long the individual contributors have been collecting map data. In contrast to the first months, many new members contributed data in the past three months. Based on the information from “How did you contribute to OSM“, which shows in what country a member performed the most map changes, I created the following chart. 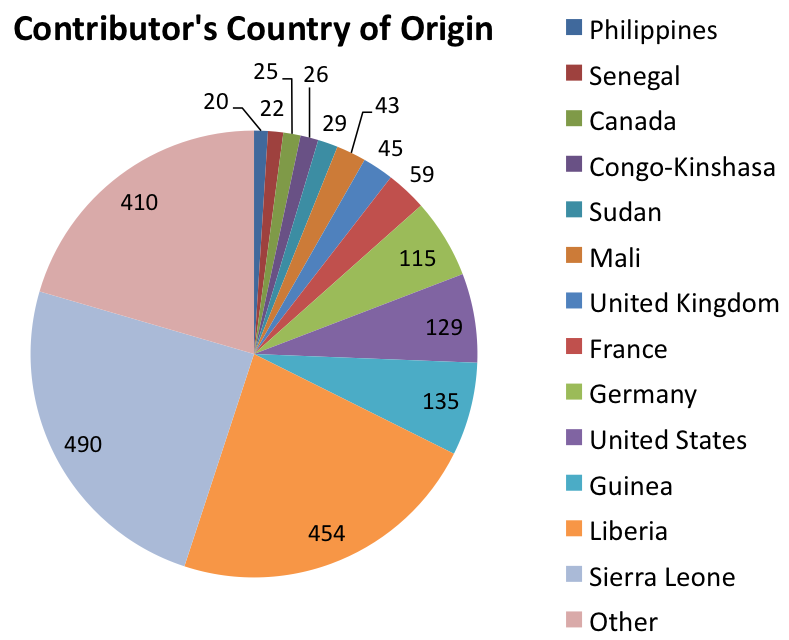 It displays the distribution of the contributor’s countries of origin. 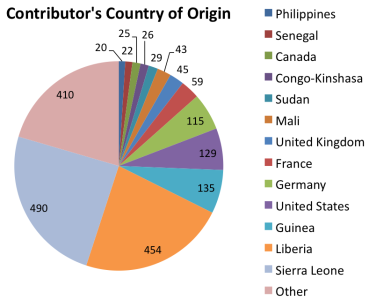 I assume that the high number of new registered members, who created many changesets during their Ebola response, moved their origin towards West Africa. However, overall more than 2,000 contributors from almost 110 countries helped so far, AWESOME! What do you think? Lastly, I would like to point to the following blog post which shows you how to search for changesets with a specific comment for any region of the world: “Filtering OpenStreetMap Changesets by a Specific Comment“. Nice post! How did you get the registration date for each user? I also would like to know how you define a change. Is deleting a node a change? Is adding a tag a change? I’m working on something similiar, so this is quite exciting for me. thank you very much for your comment. I didn’t use the registration date of each contributor. But you can get it here. I used the timestamp of the first created changeset. Right, every modification (create/modify/delete) of an OSM object (Node/Way/Relation) is a map change. For the sums I used the “num_changes”-attribut of the changesets (complete dump or replication files ). Trying to use the contributor analysis page for a project I had my student do and it keeps coming back with the error that their username could not be found. It works with mine though. Hi Kristine, thank you very much for your comment. I assume that they are newly registered OSM contributors, right? Maybe you should give it a try again in the next days.